If there’s one ailment that seems to affect everyone, no matter their age or lifestyle, it’s a sore back. Our backs take on so much responsibility in our bodies and they have to hold us up all day and support us through the night, so it’s no wonder that they often feel the strain. One of the biggest causes of back pain is poor posture and support, and while you might not even realise it while it’s happening, you’ll likely feel it by the end of the day. Think back to everything you do in just one day whether it’s sitting for long hours at the computer, driving, playing sports and exercising and watching your kids, all of these things involve the use of your back and too much stress can be doing it damage. If you’re looking for simple relief in a way that won’t cause you to change your life, a supportive seat cushion could be everything you’ve been hoping for. These cushions have been ergonomically designed to meet the shape of your body and offer you support, no matter what you’re doing, but it can be hard to find a brand that really offers what it promises. The Fortem Ergonomic Seat Cushion is a popular choice for many as it’s made from premium materials and designed to suit every different type of body. If you’ve been suffering from the consequences of poor support, one simple investment in this ergonomic seat cushion could completely change your life for the better. 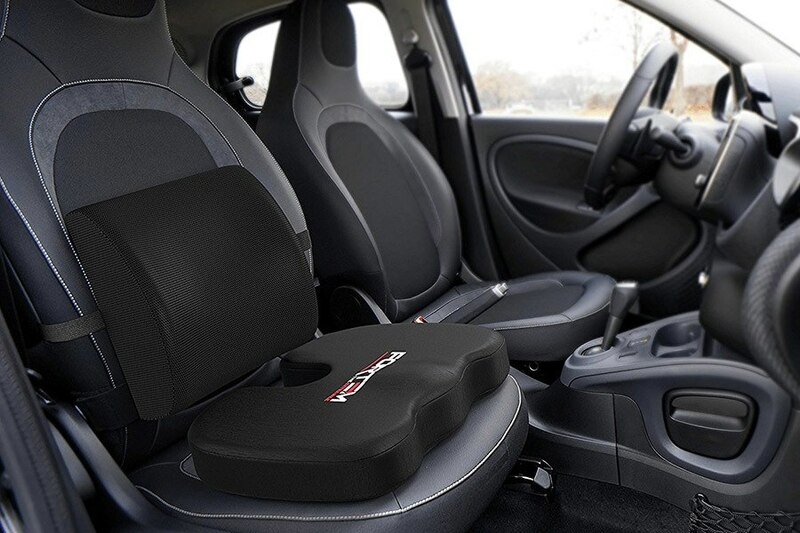 Fortem is known for creating products that make life a little easier, and their range includes everything from cushion supports to car seat protectors. Their specialized ergonomic seat cushion is an affordable way to give your back the support it needs and keep you comfortable even if you spend your entire day sitting at a desk. Too many people suffer in silence from the results of poor posture and poor support while at work home and in the car. Having a quality ergonomic seat cushion like the Fortem Seat Cushion means you’re always supported and working in comfort, and there’s no limit to who can benefit from it. This ergonomic pillow has been designed for the elderly, retirees, workers, students and anyone else who needs support, and it’s even ideal for those with injury or recovering from surgery. When compared to other ergonomic seat cushions that only offer support underneath, this is a more thorough solution that will give your entire body relief. Whether you’re recovering from surgery or just looking for a way to take the burden off your back, the Forten Seat Cushion is the answer for you. 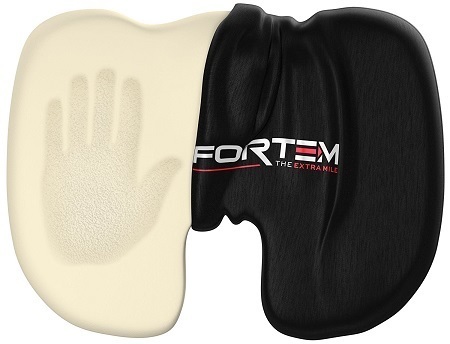 By far the biggest positive of the Fortem Ergonomic Seat Cushion is the memory foam used inside, and you can tell instantly that it’s premium quality just as promised. This memory foam is the perfect mixture of firmness with comfort so that you can sit on it all day and never feel a thing. Another huge bonus with the Fortem Ergonomic Seat Cushion is the versatility of how you can use it. Many people claim that have a separate one for the car, office and home, so you’re not limited in how you can enjoy it. 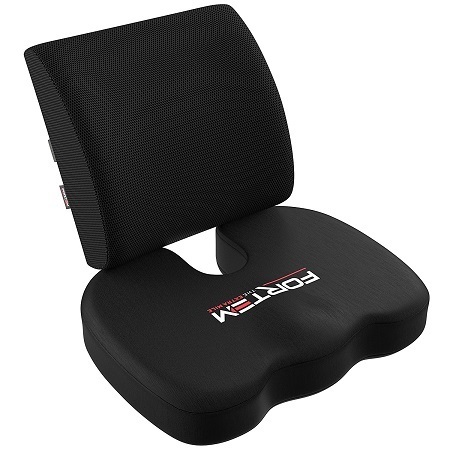 Fortem has changed the design of this ergonomic seat cushion and made amendments based on what customers wanted, however judging by the online reviews there are still some comments about the back cushion not fitting on all types of chairs. There is an adjustable strap that should make it the right size for just about every seat, however, if you plan on using it for something larger than the standard you might want to keep searching. 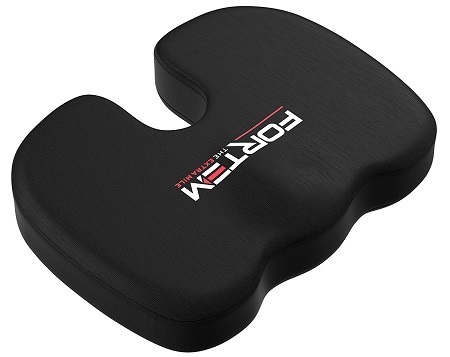 If you’re looking for an affordable solution to your back problems, you’ll want to check out Amazon for the best price on the Fortem Seat Cushion. This cushion costs under $35 and that includes free direct shipping, so there are no hidden charges for freight. Amazon Prime members can benefit further with an express shipping option which will see them receive their pillow in just two days. Fortem offers a lifetime warranty on their Seat Cushion and Lumbar Support so you know you’ll be satisfied with the product. There aren’t many brands out there that can stand by the quality of their product like this, and considering that you’re getting two products for the price of one with the back and seat cushion it’s really a deal you can’t pass up. Whether you’re suffering from a recent surgery or injury or just want to prevent future back problems, the Fortem Ergonomic Seat Cushion and Lumbar Support is exactly what you need. This innovative design is comfortable, supportive and affordable, all the while being covered by a lifetime warranty that stands behind its quality. Fortem has taken the time to update their traditional Seat Cushion and made all of the changes that their customers wanted, so you know that you’re going to be getting the very best in support and comfort. To get a Fortem Ergonomic Seat Cushion and Lumbar Support for yourself, click here to check them out.